1880s autograph album that belonged to a George from Belmont County, Ohio. 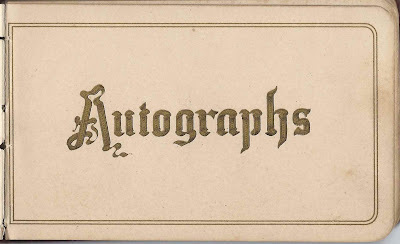 He was a student at the time he was compiling his autographs. 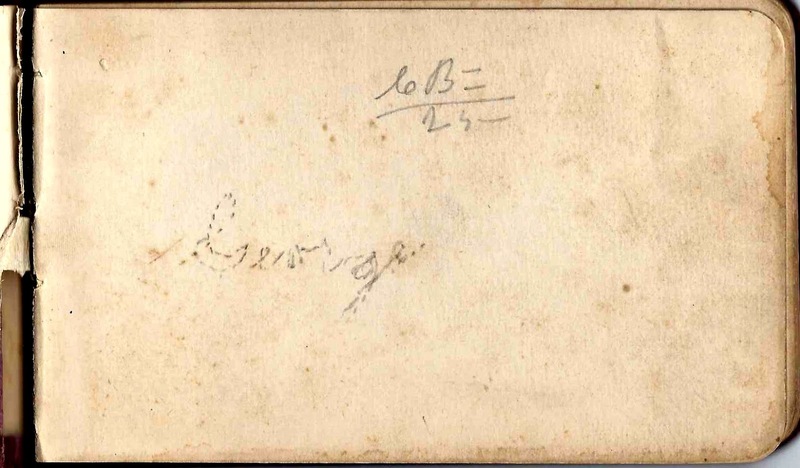 The album is approximately 5-1/4" x 3-1/4" and contains pages signed by 16 people, including George himself, who signed the first end paper shown above. Sadly, he didn't include his surname and address. 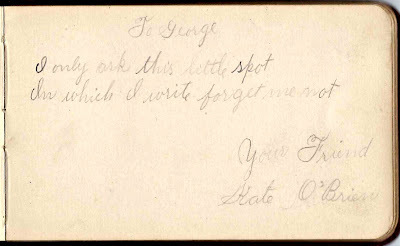 An alphabetical list of signers appears at the end of this post. 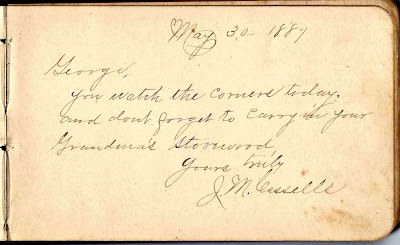 J. M. Cassells signed a page on 30 May 1887 and reminded George to carry in his grandmother's stove wood. 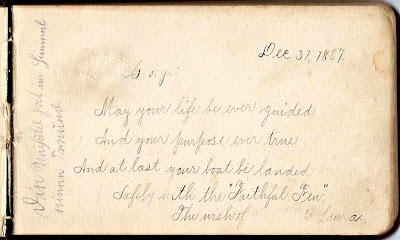 Laura signed a page on 31 December 1887. 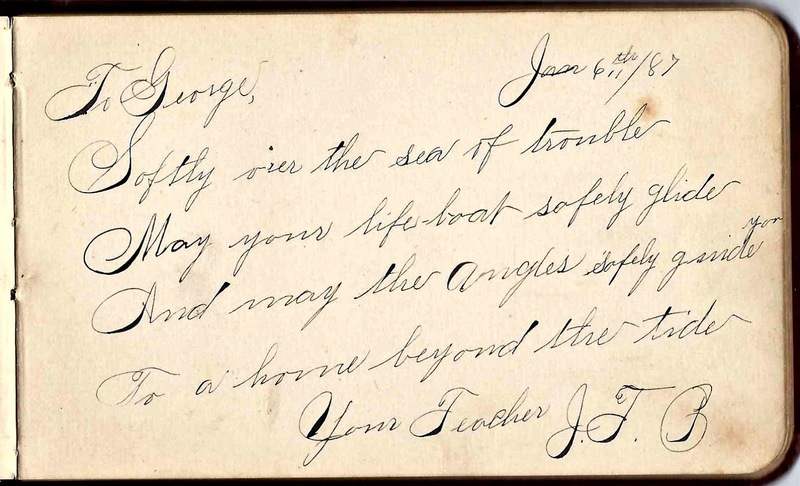 George's teacher J. T. B. signed a page on 6 January 1887. 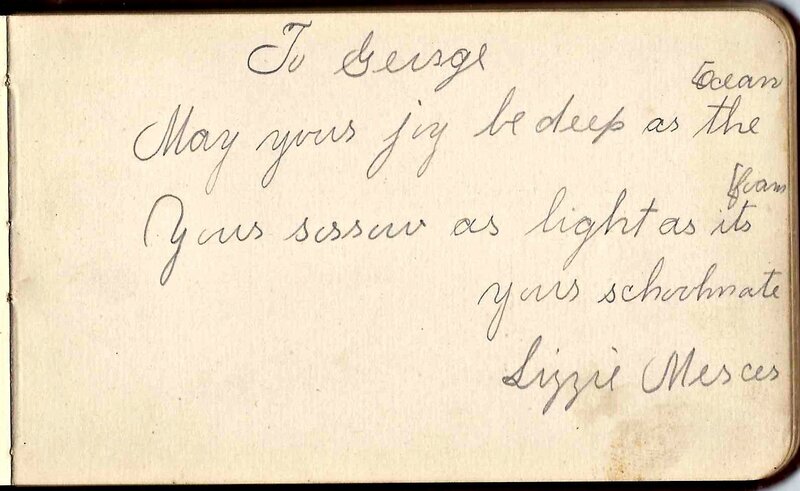 George's schoolmate Lizzie Mercer signed a page. Kate O'Brien signed a page. 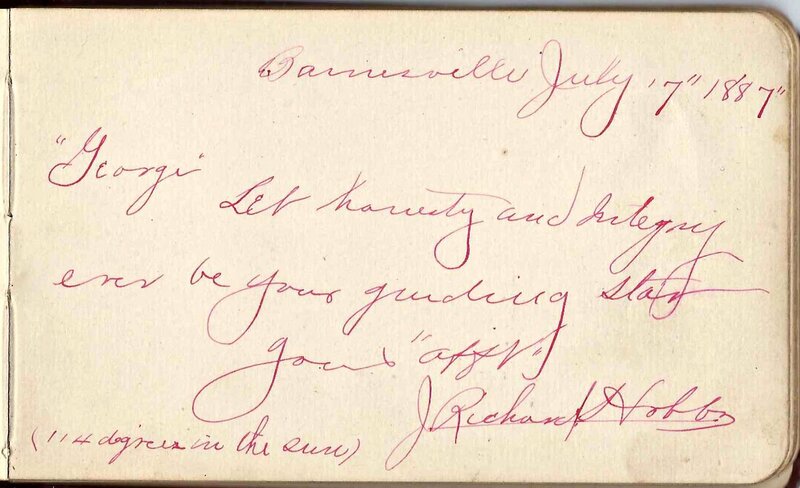 J. Richard Hobbs signed a page at Barnesville, Ohio, on 17 July 1887, a day when it was "114 degrees in the sun". George's schoolmate Mamie O'Brien signed a page. 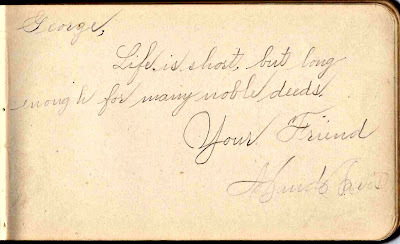 Maud, possibly Maud Davis, signed a page. 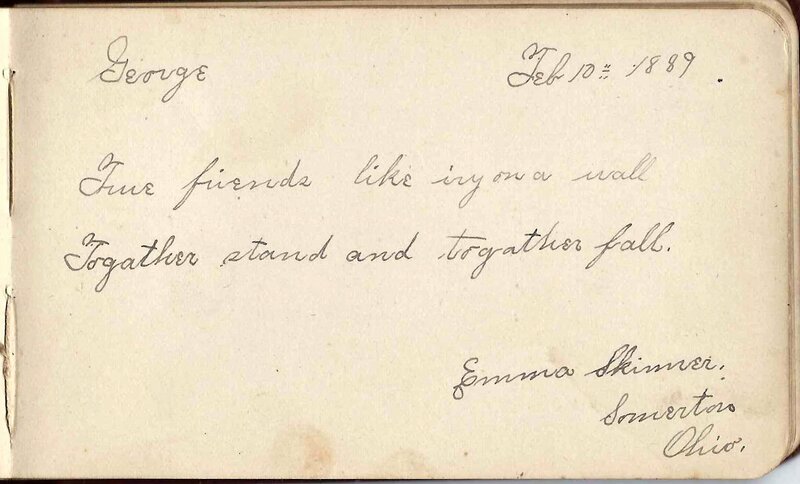 If you decipher her surname as something else, please leave a comment. 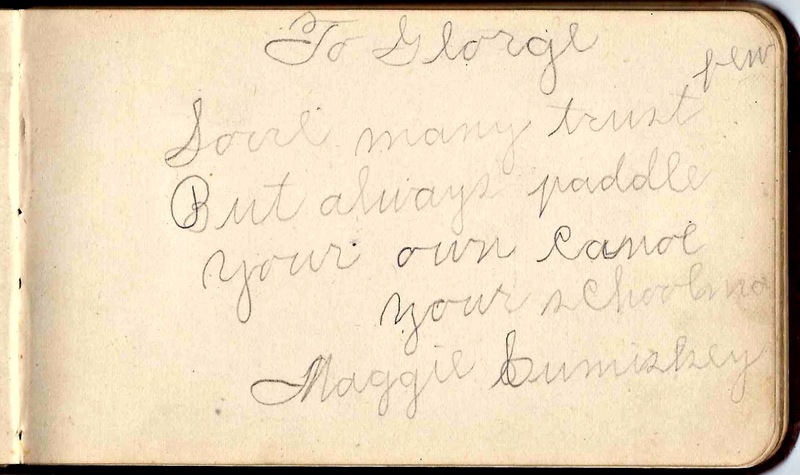 George's schoolmate Maggie Cumiskey signed a page. 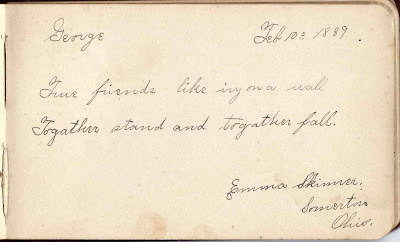 Emma Skinner signed a page at Somerton,Ohio, on 10 February 1889. 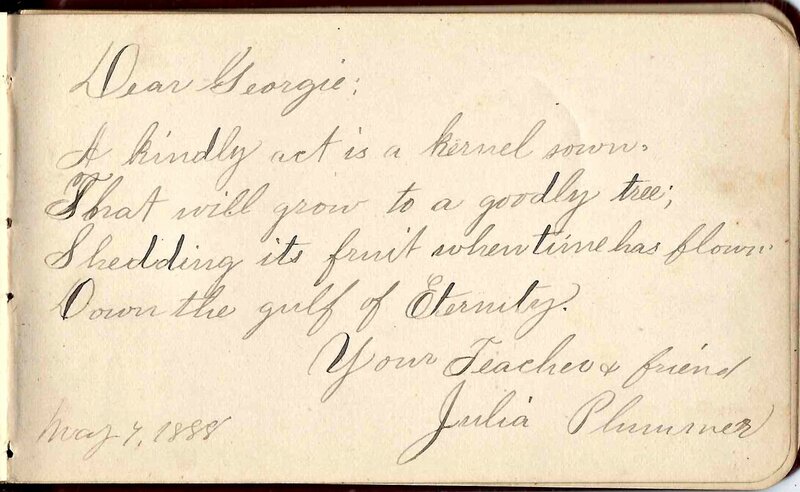 George's teacher Julia Plummer signed a page on 7 May 1888. 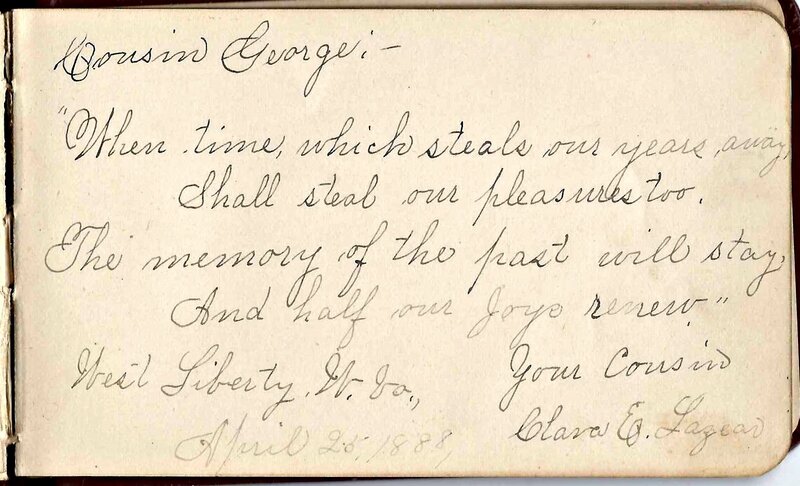 George's cousin Clara E. Lazear signed a page at West Liberty, West Virginia, on 25 April 1888. 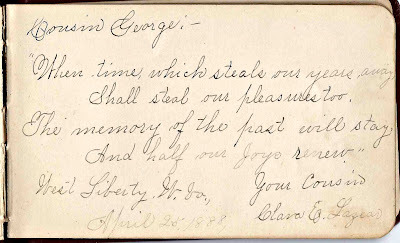 Hopefully a reader familiar with Clara's family history will leave a comment with thoughts on George's surname and parents. 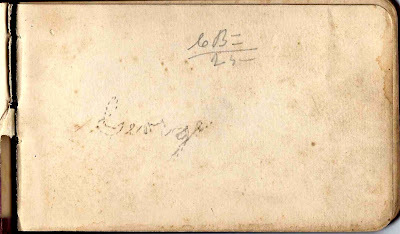 George's schoolmate Mary Cumis, or Cumiskey, signed a page. 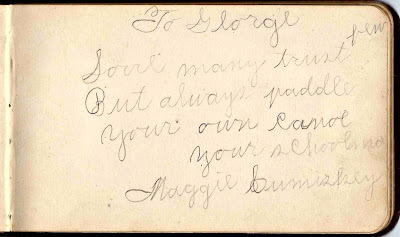 Since the word "Schoolmate" is partially missing, I think Cumis might be short for Cumiskey, as I found that previous signer Maggie Comiskey had a sister named Mary. 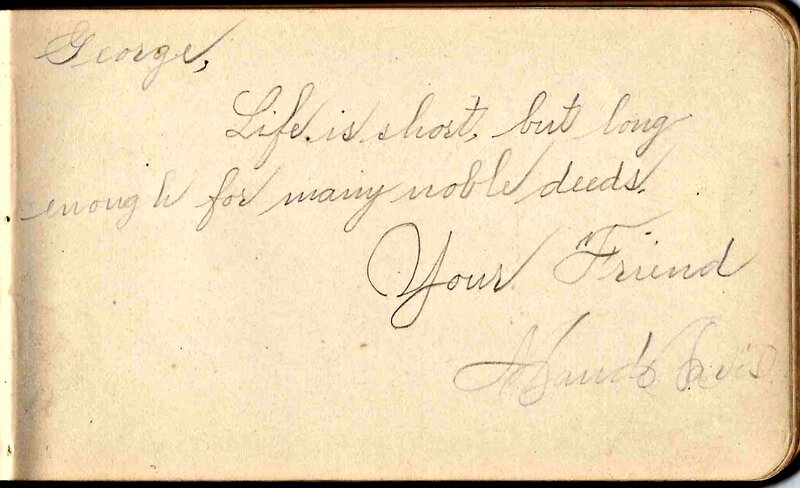 She also wrote the initials "F.L.T. 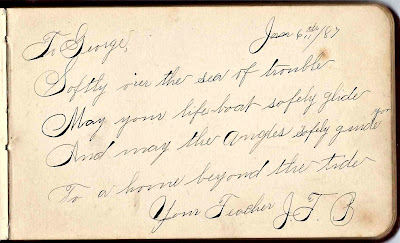 If you have information on George or any of the people who wrote pages of sentiments in his album, please leave a comment or contact me directly. Thanks! 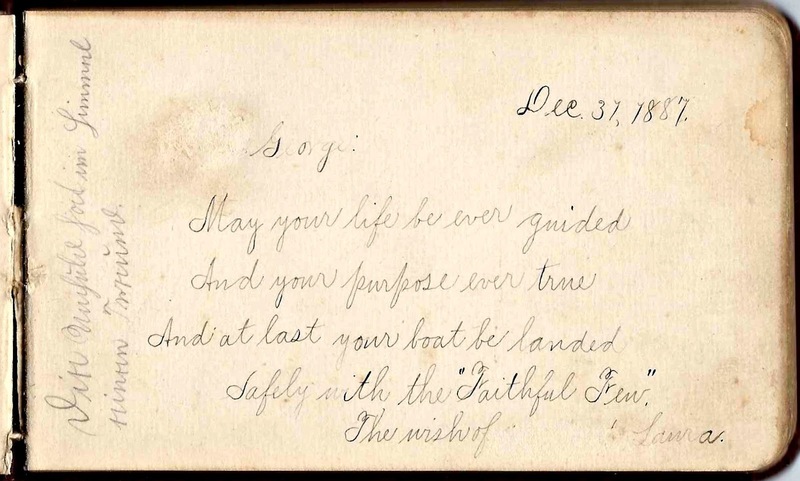 Signed Mary Cumis but possible that her surname was Cumiskey, as there was an Ohio family with both a Maggie Cumiskey, another signer, and a Mary. 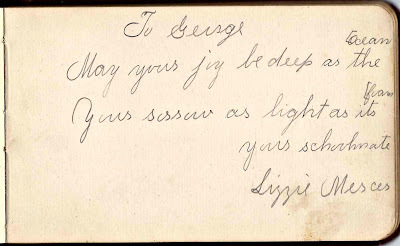 Above her surname, she wrote "Your Schoolmate" and the word "Schoolmate" is also partially missing, as though she had run out of space on the page. She wrote "F.L.T." in addition to her sentiment. 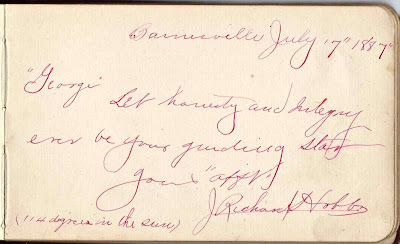 J. Richard Hobbs, signed at Barnesville, Ohio, on 17 July 1887, "114 degrees in the sun"
M. Olive Hobbs, signed at Barnesville, Ohio, "Philomathean"
My sister in law is from St. Clairsville but I didn't see her family names on the list. 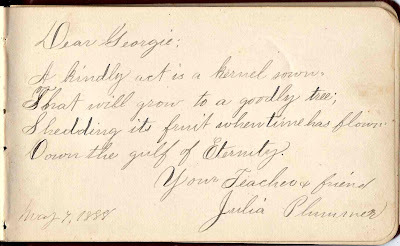 George's teacher Julia Plummer is still single and at home in 1880 in Wayne Twp, Belmont Co. That might narrow it down a little. 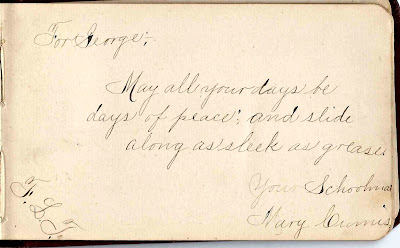 I'm sure you found the tree for Clara E Lazear with all the siblings, but no cousins named George. Her mother was named Cleary. Have you looked for George Clearys in the area? Or George with a mother named Cleary? 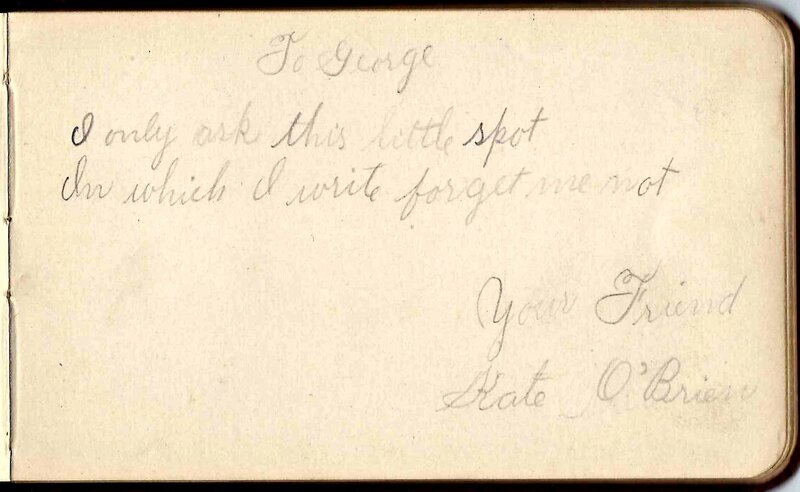 This George W. Douglas died in Illinois, but he was born in Barnsville in 1864. His mother's name was Elizabeth Cleary. 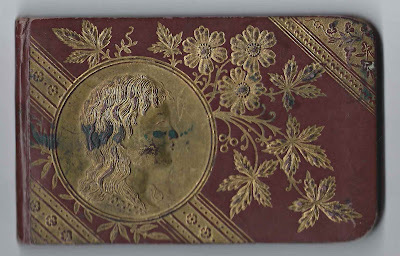 But 1864 seems a bit old to be having an autograph book in 1887. Unless he was in college. Unfortunately Clara Lazear's mother's name was Eliza Cleary also. But George W. Douglas did not fill out his own death record, and the informant might have been mistaken. 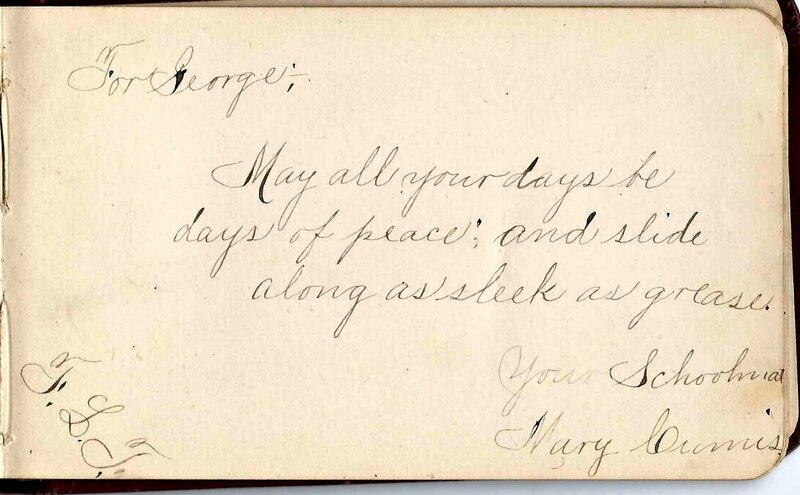 Can you narrow down George's year of birth by finding any of his schoolmates? 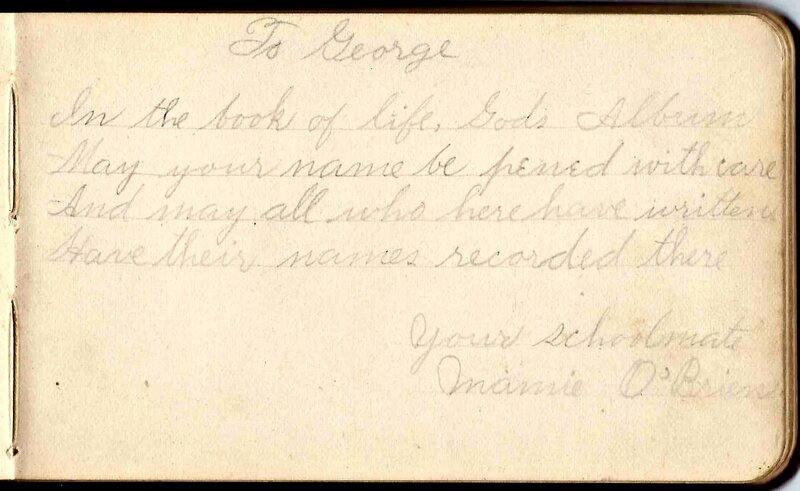 Was M. Olive Hobbs, the "Philomathean" a classmate, or older than George's schoolmates? That sounds like some kind of college society. 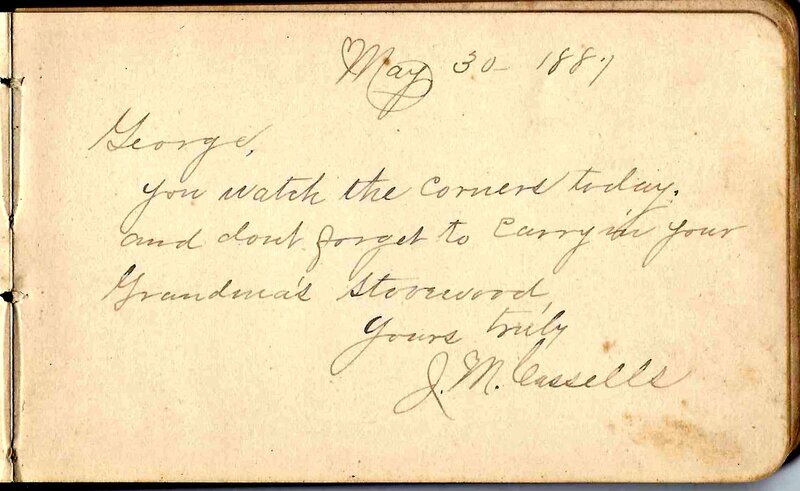 I noticed cousin George W. Douglas, too, and wondered if the album owner might be he, but was hoping someone would chime in. 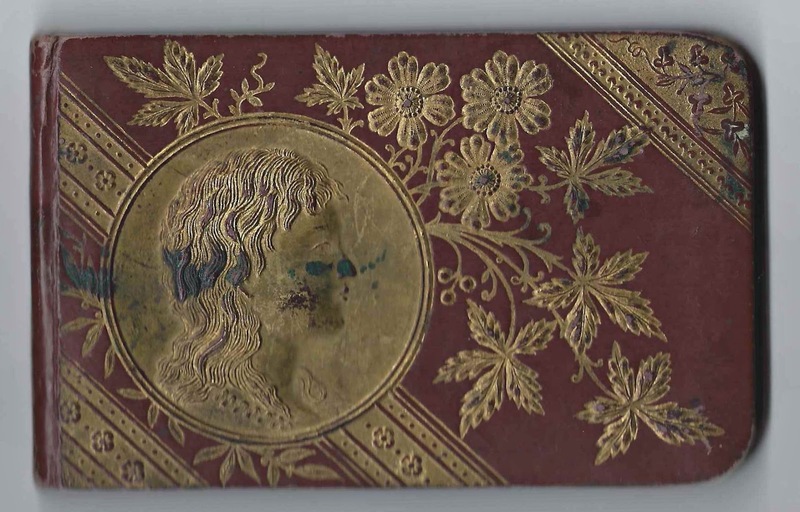 BTW, Philomathean was a society at U of Pennsylvania, so perhaps the album owner attended there as well?? Maybe it's looking better for George W. Douglas?? Thanks for your help, Ed!